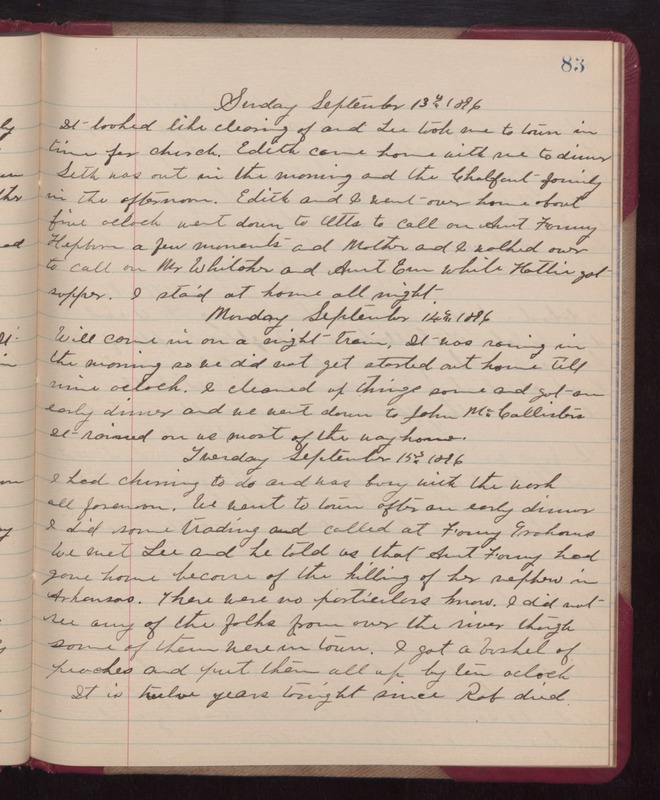 Sunday September 13th 1896 It looked like clearing of and Lee took me to town in tine for church. Edith came home with me to dinner. Seth was out in the morning and the Chalfant family in the afternoon. Edith and I went over home about five oclock went down to Otts to call on Aunt Fanny Hepburn a few moments and Mother ad I walked over to call on Mr Whitaker and Aunt Em while Hattie got supper. I staid at home all night. Monday September 14th 1896 Will come in on a night train. It was raining in the morning so we did not get started out home till nine oclock. I cleaned up things some and got an earl dinner and we went down to John McCallisters. It rained on us most of the way home. Tuesday September 15th 1896 I had churning to do and was busy with the work all forenoon. We went to town after an early dinner. I did some trading and called at Fanny Grahams. We met Lee and he told us that Aunt Fanny had gone home because of the killing of her nephew in Arkansas. There was no particulars known. I did not see any of the folks from over the river though some of them were in town. I got a bushel of peaches and pout them all up by ten oclock. It is twelve years tonight since Rob died.